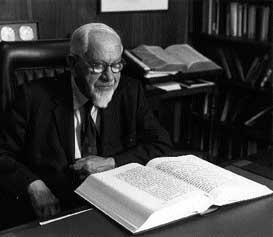 The newest branch of North American Judaism, Reconstructionism was founded by Rabbi Mordecai Kaplan, one of the most important American Jewish thinkers of the 20th century. In 1968, with the opening of the Reconstructionist Rabbinical College in Philadelphia, Reconstructionism was formally launched as a fourth denomination alongside Orthodox, Conservative and Reform. Today there are over 100 Reconstructionist congregations in the U.S. and Canada and a growing presence in Israel. Our congregations are participatory, inclusive, accessible and egalitarian. We like to think we have the best of both worlds: enthusiastic embrace of the beauty of our traditions along with openness and freedom to explore the best of our contemporary society. Today Reconstructionism is called Reconstructing Judaism. Please read more here! Rabbi Kaplan was ordained as an Orthodox rabbi and taught for over 40 years at the Conservative rabbinical seminary. Unlike these movements, however, Kaplan did not view inherited Jewish law as binding. He believed the Torah was a human document. This did not make it any less sacred! He loved and respected Jewish observance, but he taught that tradition "has a vote but not a veto." Reconstructionists continue to turn to Jewish law and teachings for guidance, but not for governance. Reconstructionists are committed to a serious engagement with the texts of our tradition, as well as to its art, music and literature. Thus, you may see many traditional customs lovingly practiced in a Reconstructionist setting. But we recognize that we are not passive recipients of these traditions, we are choosing them, challenging them, listening to the voices of our ancestors, and adding our own. Isn't that what Reform does? Reconstructionists, like all Jews, hold diverse ideas about God. In our movement, we are shaped by the founder, Rabbi Kaplan, who chose to speak about God in non personal terms. He wrote about God as "the Power in the universe that makes for salvation." More recently, Rabbi Harold Schulweis has given Reconstructionist theology language which many find helpful. While our prayerbook says "God heals the sick," many Reconstructionists would translate that as "Healing the sick is Godly." Reconstructionists share a belief in and commitment to Godliness: those values that impel us to work for a better world, that give us strength in times of need, that challenge us to grow. We use a prayerbook that maintains much of the traditional liturgy(for reasons explained above) but which includes English translations that help us to see God beyond gender and beyond the traditional metaphors. We see ourselves as engaged in a spiritual adventure to experience the Divine in our lives through honest wrestling with the insights of the past and openness to our own intuitions.